The following comments by Mr. Parr are timely and especially relevant to the wasteful way by which most homes are now constructed. First, there is a pressing need for the Construction Industry to move away from its established, antiquated ways and use technology to streamline processes, cut waste, improve sustainability and increase energy efficiency. He quoted Steven Butler of Autodesk, UK who focused on two of the biggest issues which cannot be met with current building practices, Urbanization and Sustainability. 6.4 billion of these people will live in cities. 200,000 people move to cities daily. This makes a need for 3,600 buildings a day between now and 2050. Our inefficient buildings now consume 40% of global energy. They use 25% of global water. They generate 30% of greenhouse gas emissions. 30% of construction is rework. 25% to 50% of construction is material waste. There is a serious inability to attract and develop talent. The effect of baby boomers as they retire is not yet known. Workflows are still analog based. Thus, 77% of new projects are at least 40% late. And, 98% of projects suffer cost overruns of more than 30%. The average slippage on projects is 20 months. Buildings are under-utilized and little attention is paid to the effect the finished space will have on its occupants. The main point of Mr. Butler’s presentation was that the construction industry should borrow from the factory sector and treat construction as a manufacturing process. He points out that manufacturing techniques are not new, they just need to be transferred to construction. We suggest that the E-Tech method of home construction is the best available way to meet the above. It is the most cost effective, ecologically sensitive, sustainable way of creating the highest quality living environment. Ask your architect. If there’s one thing that Barry Rosengrant wants to make clear, it’s that E-Tech System homes aren’t prefab. They’re “engineered structural components”. Rosengrant, a 30 year veteran of the building industry, wondered why homes were stuck in the Dark Ages of construction technology. In his search for a better way to build, he turned his attention to skyscrapers and the incredibly strong earthquake-and windproof moment frames that hold them up. Rosengrant wanted a truly sustainable structural system—one that would endure the test of time, take a minimum of resources to construct and promote energy efficiency in the finished product. He repurposed a commercial building technique for residential use: bolted together steel parts that can be configured into custom layouts and easily reconfigured should an owner opt to renovate down the line. What does this mean for the consumer? For starters, there is virtually no construction waste. And, erecting a structure with this made-to-spec set of components takes days, not months. Since the load is carried by the space frame, the roof can go on almost immediately, protecting both the interior of the house from damage and letting your hired workers go home in time for dinner. ---D.B. Overwhelming evidence is confirming that Electro-Magnetic Pollution has become a major source of illness. We worry about what we can see: The smoke, acid rain, dirty buildings and polluted rivers. However, we are constantly bombarded by invisible geopathic man-made environmental poison. Microwaves from TV, radar, satellites, aircraft landing systems, etc. Electro-Magnetic fields from power lines, underground cables, house circuits, electric motors, appliances, fluorescent lights, wi-fi and other computer related items. Background levels of this type of radiation have increased more than a thousand -fold this century. The human body is good at adapting but there are limits! No treatment can work well if the body is being constantly bombarded by EVS. Many therapists now realize this and insist on rectifying EVS before starting treatment. If receiving treatment for a serious illness with disappointing results, EVS could very well be the cause. Our environment has become a seething electro-magnetic smog, bombarding our senses and our bodies every second of every day. Because electro-magnetic fields are invisible, we don't even realize they are there, but they are battering us mercilessly. Electro-magnetic fields have always been part of the earth's environment. Resonances occur between the earth's molten iron-nickel core and the charged gases of the ionosphere. These pulse at definite frequencies (between 0.1 and 25Hz; mostly at about 10Hz), and act as regulators for the biological time clocks of all living creatures. If man, or any live animal or plant is totally shielded from these fields for any length of time the result is discomfort, disorientation, and even death. It has recently been shown that even each cell-division is timed according to these pulses. When the first astronauts were sent into space they returned suffering from the effects of being deprived of these fields; all subsequent spacecraft have had artificial field generators built in. These fields are generally called Schumann waves, and are a normal healthy phenomenon of our planet. Man evolved in electro-magnetic fields, and should be quite capable of handling them. This remained true until this century. In the 20th century alone, man has changed his electro-magnetic environment more than it has changed in all time up until then. Assuming that there is at least some truth in the following numbers, there is only one answer and that is to generate all electricity from your home as Net Zero homes will be the only affordable option. Wind chargers (with battery storage) have been used on farms for about 100 years but make a WHOOP -WHOOP noise however this can be solved with different blades. Solar is becoming more and more affordable, including battery storage. Geo-thermal has barely been tried by home owners but is a viable source as it works day and night, wind or not. Tesla roof tiles will be ready in a year or two and other methods will be developed when grid electric costs become unbearable. Meanwhile, a totally insulated home cuts energy costs in half. With inevitable energy increases, in a few years this savings will equal most of the mortgage payment. Examples of Support Programs and Contacts Note: Each state has its own list of such resources. U.S. Green Building Council's LEED for homes: The industry standard guidelines for environmentally responsible new-home construction, with links to "green your current home." 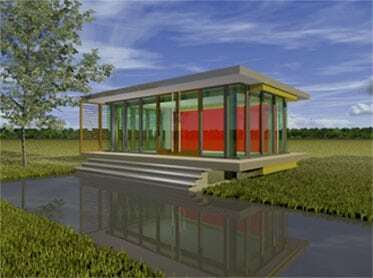 Go to http://www.usgbc.org and click on "LEED" and "Homes." Los Angeles Department of Water and Power: Information and links about energy and water efficiency, tree planting program, rebates and appliance exchanges. Go to http://www.ladwp.com and click on "Green L.A."